Since 2012, our partners in Philadelphia have shared your stories with us. The growth of both small and large startups, university collaborations, and new ideas warrant the world’s attention, and we see an opportunity to support this growth. Philadelphia and its rich history with universities and the science community is certainly enough to begin to create a collaborative startup ecosystem. Pair this with the city's grit and determination, and you have what truly sparks great innovation--people. Making the world a better place is CIC’s mission. We thrive on fostering collaborative environments where once siloed work is brought to a new light by housing diverse organizations to support one another and collaborate more effectively and efficiently. This is why we’re so excited to open offices, labs, and event spaces this October at 3675 Market Street. We’re proud to provide a critical boost to Philadelphia’s innovation ecosystem at a time when these resources can be hard to find: our premium office space and shared life-science labs give entrepreneurs and startups the launchpad to recruit national talent and highlight their innovative ideas for customers and investors. Soon, we’ll host hundreds of startups and innovators under a single roof, a density proven to foster brilliant ideas and collaborations. 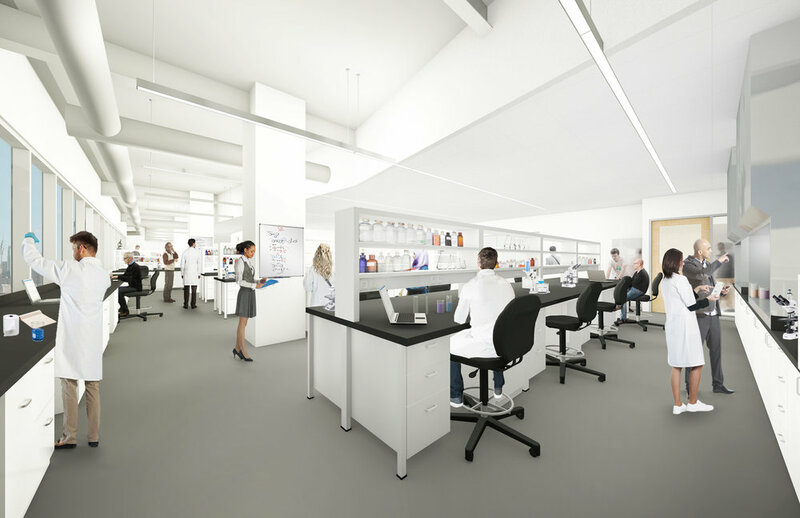 A rendering of our upcoming lab space. University City Science Center (UCSC) will close their lab space later this year, and we will embrace their residents with special incentives as they transition from an incubator to market economies. UCSC recognizes that the fuel for scientific innovation is made up of cutting edge programming and facilities, and they’ve made a strategic decision to concentrate on the former while CIC delivers the latter, giving each organization the chance to focus on what they do best. UCSC’s expertly run programs--combined with 19 years of CIC facility management knowledge--will create the best possible experience for Philly’s thinkers and innovators. At CIC, you can start with a single desk or a bench in our shared lab facility. With this model, clients will be able to launch and scale up without the need to raise capital for lab equipment and physical facilities. CIC simply charges an all-inclusive per-person membership fee, which includes full access and privileges to all common areas, including all of our scientific equipment and instrumentation. The shared lab model is incredibly successful in all major biotech hubs in emerging markets, including San Diego, Cambridge, and Princeton. We’re excited to bring this approach to Philly’s top innovators, bolstering their efforts and pushing them toward success. We invite everyone involved in innovation to come visit and discover what sets CIC apart. Newer PostOur third location in St. Louis is open! Older PostDo you need to be in a coworking space? Use our checklist to find out!